Food Service Departments are a critical part of the daily fabric of school life, yet, they often go unseen and unappreciated despite the fact they account for a large percentage of hourly staff in a school district and their “work” touches almost every child daily. Many school districts do not view the Food Services Departments as more than a requirement to make sure children are fed. The fact that Food Services Departments are solely responsible for managing the eligibility status of the entire district is often overlooked. Create the opportunity to bring the accomplishments and the challenges faced by Food Service Departments to light. Help illustrate the importance of their work and what they accomplish within exceedingly small budgets and in often outdated conditions. Highlight the “next steps” from the vision of the department itself. Assist in activating practical next steps and the inputs needed to achieve them. Site Observation and Analysis: Review of school sites’ operations, including sanitation, receiving and storage, food production, record keeping and service. Financial Analysis and Reporting: Review of the historical trends and records of food services funds including tracking and recording of purchasing, inventory, food production, catering, contracted services, direct and indirect charges, meal counts, business services interface, and the district systems for reporting State/Federal compliance. Procurement: Review of vendor velocity data, manufacturer, school co-op, distributor contracts and bids and analysis of all purchased goods for the fund. Commodity Allocations: Review practices, commodity pass through allocations (broker contracts), and direct delivery practices. Food and Menus: Review of menu planning, recipe development, ingredient selection and meal costs by type. Human Resources: Review food service organizational structure, job descriptions, and personnel expenses by area and location. Policy and Standards: Review of Wellness Policy, including any other district policies regarding food services, Standard Operating Procedures, sanitation training, culinary skills training, customer service training, and any other team building or professional development performed by the department. Marketing and Community Collaboration: – Review recent or current strategies and programs to communicate about Food Services within the district and out to the local community. Who are the “champions” of the program locally? Are there key stakeholders who are already or could be engaged to support your program position through other activities, such as gardens, after school cooking clubs, recipe contests, or farmers market entrepreneurs? Reporting – review of practices, tracking and recording of purchasing, inventory, food production, catering, contracted services, direct and indirect charges, meal counts, business services interface with food services, and the district system for reporting State/Federal compliance. Food Service Warehouse and Materials Management Operations: Review of systems relative to food services warehouse management, shipping, receiving, food production facilities, and transportation operations as operated by Food Services or in service of the department. We identify strengths and challenges within the existing system to drive the strategies for change, while considering the district’s desired outcomes. It is important to point pin the fully functioning systems that can support change versus the areas of operation that may need modification. As this will determine the feasibility of meeting the district’s goals. While working through the steps of the assessment, we are committed to communicating with the department leadership to insure a complete understanding of the assessment’s processes. Many of the findings will be shared along the way to facilitate clear understanding from start to finish. This is an example of the narrative written from observation and interviews. The findings from the different sources of data collection is critical in offering possible solutions and action items for implementation. District A’s menus were the same across all grade types, but the menus were incomplete and did not reflect all foods that were offered daily. Pizza appears to be the default second choice at all sites including elementary. However, tacos are usually offered but the posted menus reflected only one choice. For the parents who are making the decision whether or not their child is eating at school, not having complete information on the menu can result in a loss of business for the FSD. Since Manager A came to the district after the procurement decisions were made for 2014-15, she had to work with procurement decisions made by the prior manager. Though she did attempt to improve the menus to a rotating cycle Manager A did not have enough time before the school year to train the team. The school sites had trouble with the rotating cycle, therefore unable to follow the menu and ordering accordingly so Manager A reverted back to last year’s menus to create a familiar monthly routine and format based on commodities on hand or what would be received that month. In addition, because monthly inventory was not recorded or shared it was impossible to truly monitor what was happening at each site. The issues were compounded by the FSD office by the use of paper and verbal orders, making it difficult to identify the varying practices between the sites. The high school is differentiated from the other sites by offering made to order burritos, entrée salads daily and some variety in vegetarian options. With the district’s internationally diverse population, having enough variety and foods that are culturally appropriate is a challenge that Manager A is addressing. They have incorporated hummus and falafel into the menu by purchasing ready to serve products, but have not attempted any of these foods from scratch. A review of all practices and tools is conducted to assess the current financial state and to offer solutions to ensure financial success for the department. One component of the assessment is to review the fiscal side of the Food Service Department (FSD). The fiscal systems in place at Public School A were reviewed to determine what tools are currently being used and what additional tools or modifications to existing tools are needed to provide the Food Service Manage the resources necessary to ensure the continued financial success of the program in preparation for transitioning toward a whole food, scratch-cooked model. The tools used by the department are also compared to best practices required to support programmatic changes. After a comprehensive review, recommendations are laid out for each area of the assessment. The kitchen sites are aged and reflect a lack of investment over many years. Only a few pieces of equipment have been recently purchased and installed. Our recommendation of returning production to the middle school will be the most cost effective way to focus investment for cooking equipment in one main location. Across the district the service line flow and the equipment used to serve the meals need attention also ‒ Building A being the most challenged with its cramped layout compared to Building B which has a line that is so oversized for the number of meals it serves. It is also recommended to install sneeze guards, improve the current line and replace the dining tables and chairs. 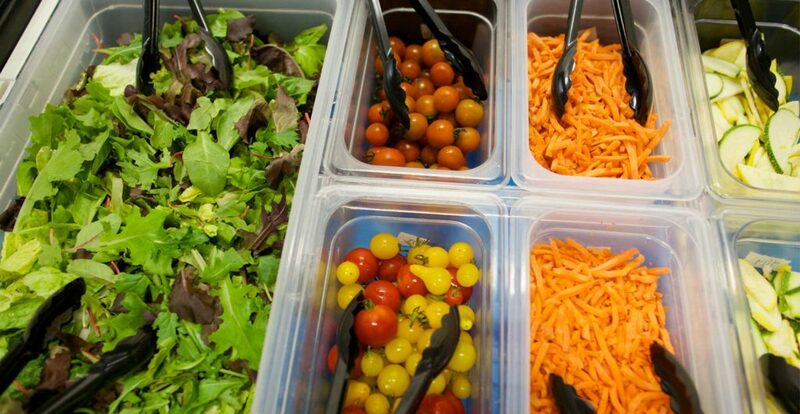 In addition, all sites need salad bars which provide an excellent initiative for rethinking the flow and efficiency of every site. The comprehensive assessment is a combination of narrative, graphs, spreadsheets, and photos documenting the entire process. Recommendations are laid out for each area of the assessment. The district has three sites that produce all or part of their meals on site. There are three positions at the school sites, Assistant Manager, Full-time Food Service Worker and Part-time Food Service Worker. The sites are supported by a full-time Storekeeper/Driver, which is primarily based at the high school but also performs delivery and kitchen floor cleaning tasks at various sites. There are currently no job descriptions, employee handbooks or training manuals for the positions, all of which are required. The high school, middle school and elementary have assistant manager positions, which are allotted 8 hours daily, the full-time Food Services Worker at 6 hours. Based on the finding from the assessment, this section in built into the strategy and implementation plan. It is a highly customized area, as no two districts are the same. Each has their own unique set of needs when it comes to support.